The Lightbox Gallery allows you to create image galleries within your Moodle course. Small thumbnails will then be generated, which are used for the thumbnail view of the gallery. For instructions on adding this resource, see Moodle 3: Activities & Resources: Add a Lightbox Gallery. In the General settings, the instructor must provide a name for the resource. Adding a description is optional. In this section, instructors must decide how many images to display on each page, to include the caption text, and where the caption position will be for each image. 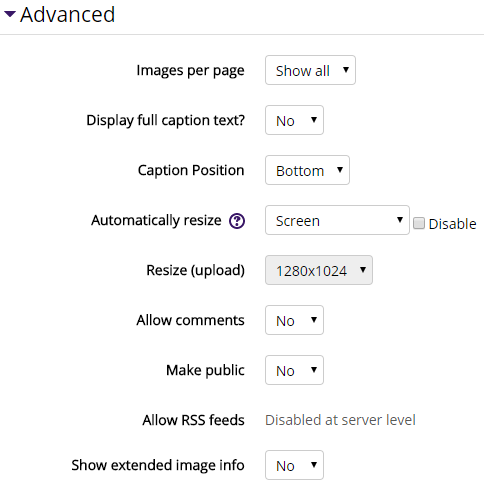 Additionally, they can choose to automatically resize an image, allow comments, or show extended image information. These settings specify the visibility of the assignment for students (Hide/Show). The lightbox gallery can be restricted based upon a date, group, activity completion of another activity/resource in the course, etc. By default, students can manually mark the the gallery as complete, but an instructor can change this to be required. If required, the students can be marked complete by viewing the lightbox gallery.